What’s the Cooper Square Community Land Trust? The Cooper Square CLT was created in 1991, but its roots go back to 1959, when planning czar Robert Moses proposed to level an 11-block area in the Lower East Side and replace it with what might now be dubbed “affordable housing” – union-sponsored coops. The Cooper Square Committee (CSC) of residents and businesses organized in opposition to the Moses project stating that even at below-market prices the new coops would be out of reach of the majority of current residents. In 1961, the Committee completed its own plan for the urban renewal area that included preserving existing housing and building new low-income housing. 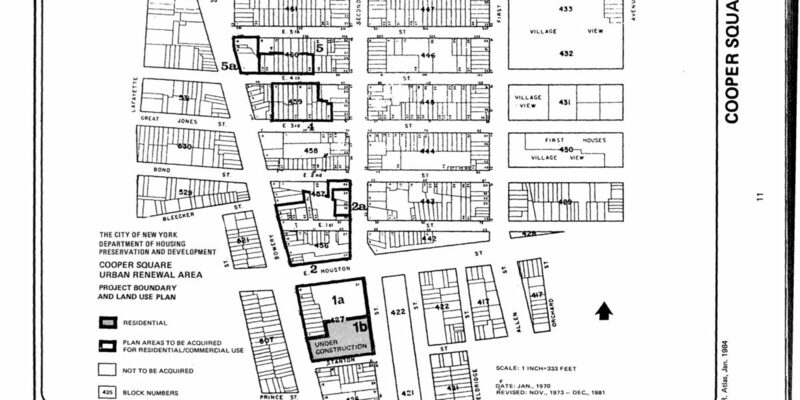 After ten years of advocacy, the City accepted their Alternate Plan for Cooper Square (Cooper Square Committee, 1961), the first community-initiated plan to be adopted in the city. Shortly thereafter, the City’s fiscal crisis and the federal shift in housing policy away from low-income housing left the neighborhood advocates with few programs with which to implement their plan. Their first low-income project was completed in 1984 using project-based Section 8 funds. It took over two more decades to see the entire urban renewal plan implemented. Currently construction on the remaining vacant lots will result in new mixed-income housing and community facilities supported by the CSC. Negotiated by a new Cooper Square leadership, the latest phase of new housing has almost 70% market-rate units, but even with this new development 60% of all housing in the urban renewal area is still far below-market and houses tenants falling under 50% of the Area Median Income. The buildings in the neighborhood that had been slated for removal under the original urban renewal plan remained, thanks to the opposition of the CSC. However, with the cloud of eminent domain hanging over them, and in the absence of any intervention by the City, these buildings were abandoned by their private owners, in part a product of “planner’s blight.” Building abandonment in the Lower East Side was also a widespread phenomenon outside designated urban renewal areas. In the 1960s and 1970s, New York City landlords walked away from hundreds of thousands of units of multifamily housing occupied by low-income tenants in the South Bronx, Harlem, Central Brooklyn, and the Lower East Side. Lacking heat, hot water and other services, some tenants left; others took over their buildings and kept them operational. Squatters and homesteaders were particularly active in the Lower East Side. The abandoned buildings joined the growing stock of in rem housing (taken by the City for non-payment of taxes). In a matter of a decade the City wound up owning over 150,000 housing units city-wide. Despite calls by housing activists for a land banking policy (Homefront, 1977), the City’s policy was to dispose of the units, either to the tenants or to non-profit or private developers. The Division of Alternative Management Programs (DAMP) of the City’s housing agency, through its Tenant Interim Lease (TIL) program, was responsible for managing the units and planning their ultimate disposition, not for maintaining them in perpetuity. The problem they faced, however, was that most tenants, particularly those in the Lower East Side, were too poor to afford even a minimal down payment, and the formation of stable tenant-run entities in each building was a difficult and long-term task for which the City was ill equipped. The Urban Homesteading Assistance Board (UHAB), a non-profit group established in 1973, successfully guided 27,000 families in 1,300 buildings in the formation of limited-equity coops, and other buildings were either vacated and demolished or sold. The Cooper Square Committee wasn’t just looking to acquire units from the City. It was led by community organizers and tenant advocates who were committed to stopping displacement and preserving existing housing, and they became housing developers only to confront the practical problems they faced when their members found themselves taking more and more responsibility for their buildings. Frances Goldin, Cooper Square’s main organizer for decades, had been a founder and leading activist in the Metropolitan Council on Housing, the city’s largest tenant organization. Cooper Square helped tenants organize to get the City to provide services in the in rem units. They helped tenants fight evictions. After fighting off efforts by the City to get rid of the in rem units and all responsibility for them, in 1990 the CSC faced a more friendly approach in the new administration of Mayor David Dinkins, New York’s first African American mayor, and whose home base, Harlem, was the Lower East Side’s closest ally in the political battles for low-income housing and community control of vacant land. The CSC created the Cooper Square Mutual Housing Association (MHA) in 1991 to manage 303 units of multifamily housing and 23 commercial units in 19 buildings, mostly within three blocks of the urban renewal area. The MHA has a central management covering all the buildings, and is governed by a board made up of two-thirds tenants and one-third appointees of the Land Trust. The cost per household to join the MHA was (and still is) $250. The Cooper Square Community Land Trust was founded in 1991 at the same time as the MHA, with a board made up of one-third tenants and two-thirds community residents or public members. The Land Trust owns the land on which the MHA buildings reside. The Cooper Square MHA is one of several mutual housing associations in New York City (see Krinsky and Hovde, 1996). Despite other efforts to organize land trusts we found only two currently functioning in New York City – Cooper Square and an East New York (Brooklyn) land trust, also affiliated with a mutual housing association. The housing in the latter land trust consists of several hundred units in 113 buildings that were once in rem and occupied by low-income tenants. ACORN (Association of Community Organizations for Reform Now) was the main community organizer and the Pratt Center for Community & Environmental Development (PICCED) provided technical assistance, as it had with Cooper Square. According to CSC leaders, the principal influence in founding the mutual housing and CLT was the mutual housing model from northern Europe. Dutch students and professionals who interned at CSC made the case for the mutual housing model, which was also supported by housing specialists at PICCED. While there was some initial connection with emerging land trusts in other parts of the U.S., the Cooper Square CLT emerged in relative isolation and has not been a part of national coalitions or had any consistent contact with other land trusts. This isolation may be a product of the dramatic differences between Cooper Square’s central city context and those of other land trusts. At present, they are in the process of seeking State approval for cooperative ownership of the buildings. The new limited-equity coops would remain affordable in the long term under the land trust. In effect, they would continue to function more or less as they have under the mutual housing model. The Cooper Square units are undoubtedly among the lowest cost housing in what is now a partially gentrifying neighborhood. Two bedroom apartments, for example, rent at $431 per month, affordable to households at less than 25% of the Area Median Income (AMI). Since 1991, rents increased only once, in 1994, by slightly more than 3%. We will discuss the significance of these low costs later on.